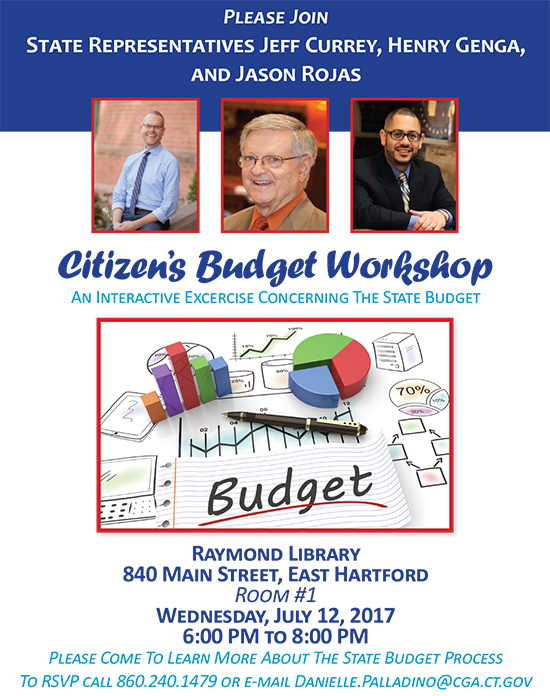 On Wednesday, July 12th I'm hosting a Citizen's Budget Workshop along with State Reps. Henry Genga and Jason Rojas. The budget process is lengthy and complex, and this year it has been particularly challenging as we continue to work with everyone involved to create a resilient state budget. This workshop is an opportunity to learn how the process works and gain a better understanding of the issues underpinning the budget challenges and opportunities. We'll walk you through an interactive budgeting exercise that allows you and our neighbors to offer suggestions and feedback on the choices facing Connecticut. The legislature continues to work toward an agreement on a balanced budget. House Democrats recently released our revised balanced budget, and the House will convene a special session on July 18th. RSVPing is appreciated, please click here to RSVP by email. I hope I'll see you on Wednesday for a productive discussion about the state budget process.